Hockey History Repeating? Do The Penguins And Red Wings Compare To The 1980s’ Oilers And Islanders? Christopher Ralph is a staff columnist at THW. As I watch the conference finals and as much as I want to see a Penguins – Blackhawks final, I am facing the inevitable – we are likely going to see a rematch of last year’s Stanley Cup Finals – Detroit versus Pittsburgh. In today’s NHL, in which parity is running rampant, salary cap straddled teams have only remote opportunities to build, let alone maintain a dynasty. This makes the accomplishments of GM Ken Holland and the rest of the Detroit Red Wings management, coaching and scouting staff all the more impressive – to keep a team so consistently Cup competitive. I’m taken back a quarter of a century, when I was just a young hockey fan and emerging hockey fanatic when, in at least my opinion, the changing of the guard was taking place between the two last true dynasties in the NHL. In the 1982-83 season, the New York Islanders completed a four year reign of the Holy Grail, defeating a young and talented Edmonton Oilers team lead by a 21-year-old Wayne Gretzky. (Prior to the super streak by the Islanders, the Montreal Canadiens had hoisted Lord Stanley’s up four years consecutively as well.) The following season, spanning 1983-84, the young and super-talented Oilers would not be denied. Edmonton defeated the veteran Islander squad in 5 games, not quite achieving the sweep which had done onto them the previous year, denying the Islanders a chance to tie the immortal streak of 5 consecutive Cup wins by the Canadiens from 1956 to 1960. Gretzky and the Oilers had learned and gained experience from the best, and then defeated the best in an obvious passing of the torch and changing of the guard. No matter how remote and loose the following comparison might be, I cannot stop myself from comparing the Pittsburgh Penguins and the Detroit Red Wings to the aforementioned 1980’s editions of the Edmonton Oilers and New York Islanders, respectively. Read on before condemning me as a borderline hallucinogenic optimistic hockey writer, and remember I did state my comparison is a fairly “loose” one! Phenomenom blueliners Denis Potvin and Niklas Lidstrom draw similarities given their superior two-way play that is unparalleled to all but a few of the game’s best defenseman ever. Take a look behind the masks with Chris “Os-Good As It Gets” Osgood and Battlin’ Billy Smith. I think it is more than a stretch to say Osgood compares to Smith. The latter is known as one of the greatest playoff clutch goalies of all time. To his credit though, Osgood is a battler himself. Constantly considered the weakest link of the Red Wings, he more often than not rises to the occassion the greater the importance of the game. A big surprise is the notorious Billy Smith failed to make this Top 10 Goalies (Not Girls) Gone Wild video, but “Ozzie” was featured with St. Patrick Roy as numero uno! Bob Bourne and Daniel Cleary? Not such a stretch as both are respectable scorers in the regular season, while raising their production in the postseason. Bourne actually led all scorers with 28 points during the 1983 Cup run. It is Cleary’s energetic and gritty play that make him an even more valuable contributor to the Wings though. Although different positions, Marian Hossa’ play as a two-way threat is reminiscent of now Devils’ coach, Brent Sutter. Watch Johan “The Mule” Franzen, and John Tonelli’s exploits come to mind. Although Tomas Holmstrom provides an immovable presence in the crease in the offensive zone, Jiri Hudler, Valtteri Filppula and Mikael Samelsson do not exactly compare to the physical presence of Bob Nystrom, Clark Gillies and Duane Sutter. However, in the post-lockout era of the NHL, with the cutting down on the clutching and grabbing, the previously mentioned speedy forwards of the Red Wings add to their dominance in today’s NHL. Going back to the blueline, more similarities can be found: Brian Rafalski and Tomas Jonsson, Niklas Kronwall and Stefan Persson, Brad Stuart and Ken Morrow. Convinced yet? Or…have you come to the conclusion I am more delusional than when you started reading? Onwards and upwards, how do the current day Pittsburgh Penguins stack up against the formidable Edmonton Oilers of the mid to late 1980s? Choose who resembles who as you wish, but Sidney Crosby and Evgeny Malkin are the Penguins’ version of Wayne Gretzky and Mark Messier. “99” and “Mess” are obviously legends of the game and two of the greatest of all time. SC87 and “Geno”, however, are both in the top 3 of all players in the NHL today. Amazingly, they are 21 and 22 years old, respectively. “99” and “Mess” were both 22 years old in that 1983-84 first Cup win for the Oilers. While Marc-Andre Fleury has a long ways to go to match Grant Fuhr’s illustrious careers, like Fuhr, Fleury has the knack for the spectacular save at clutch moments in key games. Again, like Fuhr, Fleury could let in maybe four goals in a game, but make a key save to preserve his team’s win in a shootout game. Although not up to Glenn Anderson’s standards, Chris Kunitz is Pittsburgh’s answer to the explosive skating former Oiler. Kunitz did manage to notch his goal of the playoffs tonight and the Penguins will count on him for even more going forward, as I mentioned previously in my Top 10 Key Players In Hockey’s Version Of The Final Four article. On the blueline, Kris Letang does not really have an Oiler equivalent in his style of play, but he adds the offense that defensemen such as Kevin Lowe, Charlie Huddy and the Randy “The Doctor” Gregg provided. Phillippe Boucher, when healthy, I liken to Kevin Lowe, with more offensive potential. Brooks Orpik’s physical defensive game reminds one of Lee Fogolin, former Oiler captain. Jordan Staal’s impressive two-way game can be compared favourable to Kenny “The Rat” Linsemen, although the latter had a more “dirty” player reputation than Staal ever will. 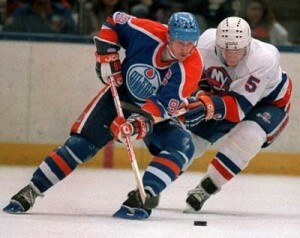 Unfortunately for the Penguins they do not come close to having a comparable winger to former Oiler great Jari Kurri. Last year they had Marian Hossa, who one could liken to Kurri, but this season he skates behind enemy lines in Motown. The Penguins do have some depth on the wings and are getting contributions from the likes of a rejuvenated Billy Guerin, Miro Satan, Ruslan Fedotenko, amongst others. Like the Oilers’ key role players Pat Hughes and Dave Hunter, the Penguins also get great ice time out of guys like “Mad” Max Talbot and Matt Cooke. Even with the above analysis and comparisons, in this salary cap world, both the Red Wings and Penguins are hard pressed to match up to the dynamic dynasties of the Islanders and Oilers of the 1980s. Because of the same salary cap and resulting parody in today’s NHL, Detroit and Pittsburgh might be the closest thing we see to dynasties we may have the opportunity to witness in the foreseeable future.